Though he hasn't exactly won the big awards just yet, there's no denying that B.A. Johnston has built a national following around his fun songs and unique sense of humour. He just might take that to the next level with a proposed new web series that focuses in on his native Hamilton, ON. The proposed show is called B.A. 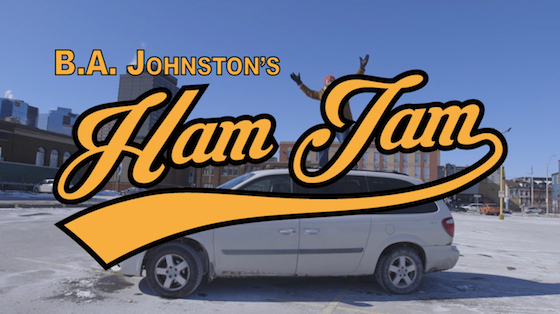 Johnston's Ham Jam, and when it's done, it will be made up of eight episodes in total. As a press release explains, "Johnston is enlisted by the Hamilton Tourism Action Committee to produce tourism videos to promote the city. As fans of Johnston's music know, Hamilton figures as a prominent character in his songs, and the web series will give a new platform to BA's odes to the decaying industrial city." Chelsea McMullan is the filmmaker behind Ham Jam, and you may recognize her name from the Rae Spoon feature film My Prairie Home, which played at Sundance in 2013. Production on Ham Jam is expected to go into production by the end of the year. Until then, Exclaim! is happy to premiere a proof-of-concept video today. The clip doubles as a fun, Hamilton-themed music video, and it can be viewed below.